Hey everyone, it's Hilary here today showing you this fun little card set, using the newest collection released by Authentique Paper called, "Favorite". 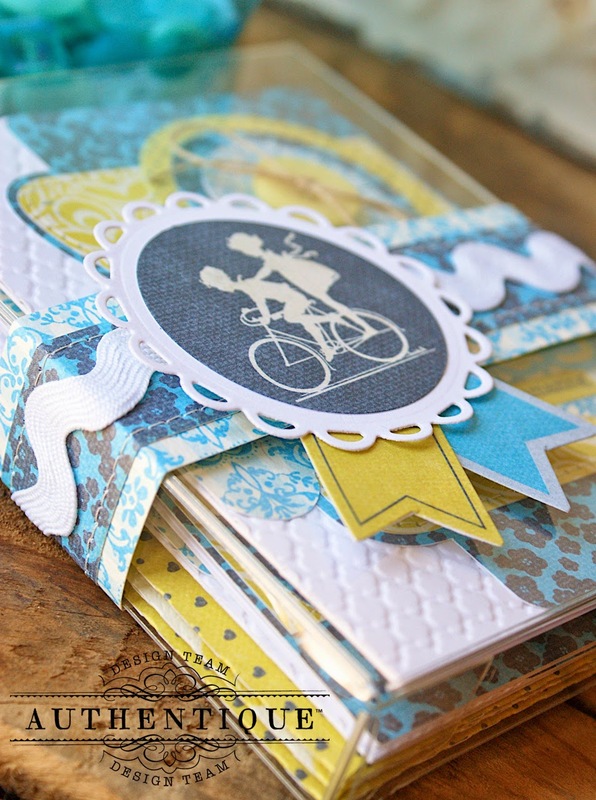 I love this collection, ahhhh those sweet blues and yellows are just so amazing together! It's an incredibly versatile set with so many possibilities! For my project, I decided on a "thank you" card set. My daughter recently celebrated her 17th birthday, and I was inspired to create these after I saw her so diligently writing out her thank you notes for all her birthday gifts. This would make a great gift for a loved one as well. I hope you enjoy! These cards were incredibly easy to make. I made 4 that were basically all the same, including matching envelopes, and they all fit perfectly into a clear card box, that I lightly embellished. Begin first with a white cardstock background, with the standard cut 4 1/4 x 5 1/2 in card base. To that I embossed using an embossing folder and card panel measuring 4 1/4 x 5 1/2 to fit the front of the card. To that I used some SVG files to cut the pattern paper for the cards. I found the backgrounds here, (I used the pattern for the "Feel better soon" card. Then adhered the cut papers to my card. I then downloaded the "thanks" from this collection here, (I used the "thanks" from the lantern card). I then adhered that to my card. I then finally used the "Fringed Flower" die from Sizzix to create the paper flowers at the top, secured the layers of the flower with a button and twine, then adhered it all with a dab of hot glue to the card as shown. For the clear box, I found the boxes here, then simply wrapped the box with a two strips of pattern paper sewn together, adhere ric rac ribbon around the middle, then finally add a sticker medallion using the stickers from the "Favorite" sticker sheet. The matching envelopes are also from SVG Cuts and the files can be found here. 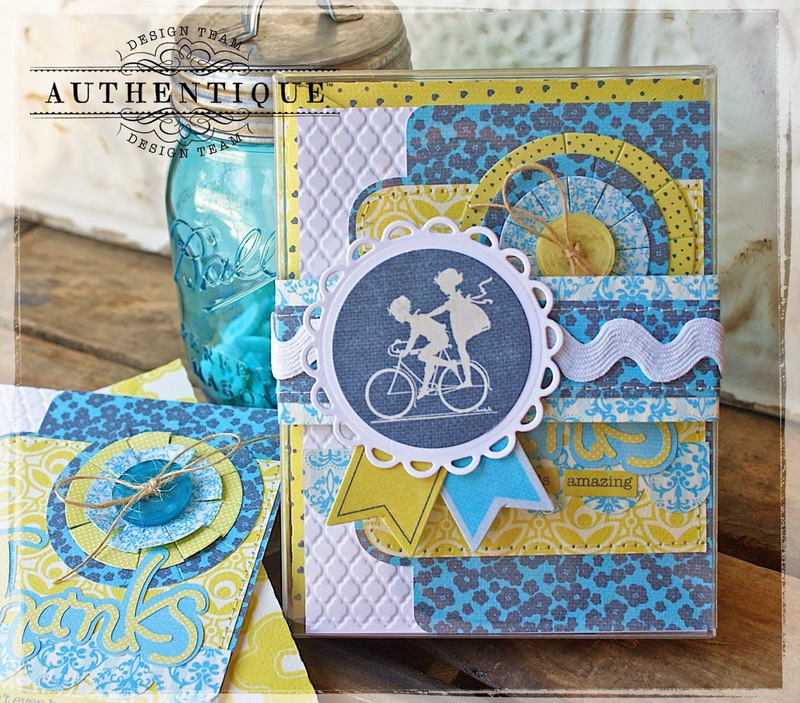 Embellish the bottoms of your cards with small phrase stickers from the "Favorite" collection and voila! Each box holds 4 cards with matching envelopes nicely, as long as the cards are not too heavily embellished with 3-D embellishments. Thank you so much for stopping by today. I hope this set inspires you to create a set for yourself or for a friend. Thank you cards are so welcoming in the mail, and fun to send too. White cardstock, misc buttons, twine, embossing folders, clear box, ric rac ribbon, and a good permanent tape adhesive such as PowerBond by Tombow. Wow, really fabulous card! Your layering looks amazing! These are beautiful, Hilary! I love your layering. I love the "favorite". Very awesome creations.